It would take all of these big names to tell a story so bold, indeed. Set in 2029, the film takes place as the two Koreas embark on a five-year plan for unification. But a conflict occurs between the top government agencies, with Gang’s character Im Joon-kyung -- or “Inrang” -- and Jung’s Jang Jin-tae in the middle of it all. K-pop star Choi, who expressed his excitement about starring alongside big names in the film industry, will play Jang’s right-hand man. 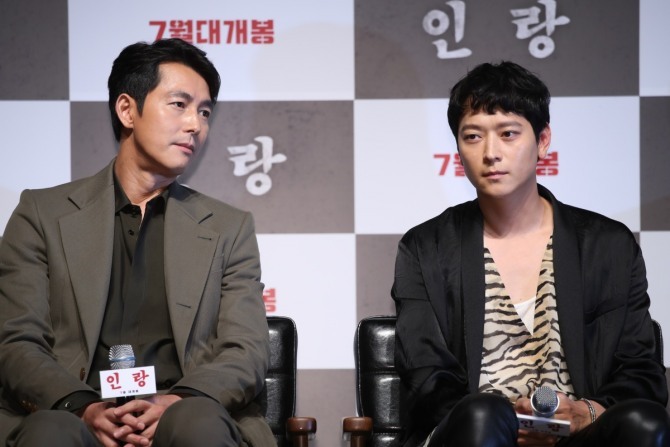 Director Kim noted that the film will delve into a man under mental duress. Han plays the sister of a “red-caped girl” who blows herself up in front of Gang. This is expected to be a key incident in Gang’s life, considering that the five-year unification setting, according to Kim, is intended as a healing period for a traumatic incident. While the flick is a sci-fi/action film, a romantic encounter between the characters is expected, Kim said, adding that elements of melodrama and science fiction will be infused into the movie. The film is a remake of the 1999 Japanese animation “Jin-Roh: The Wolf Brigade” by Mamoru Oshii, which has a cult following. Whether the veteran director’s efforts have paid off will be seen when the film opens in local theaters on July 25.